Sir Lawrence Alma-Tadema: Preparation in the Coliseum (1912) | Vivat! Crescat! Floreat! 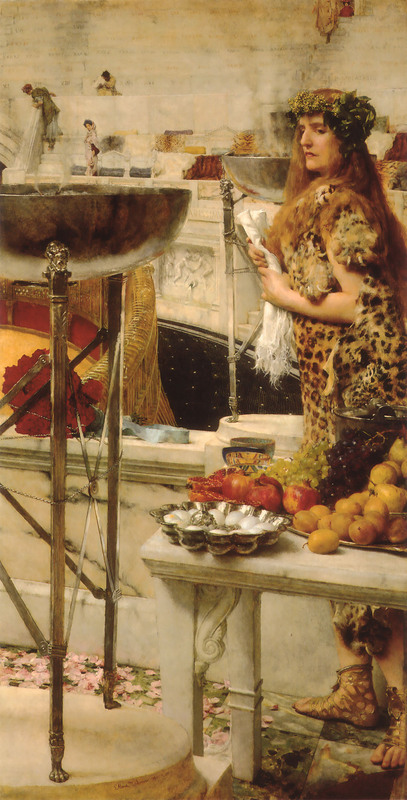 Preparation in the Coliseum (1912) was Sir Lawrence Alma-Tadema’s last major composition. Since the death of his wife Laura in 1909 he was broken. In June 1912 he traveled to Kaiserhof Spa in Wiesbaden with his daughter Anna. He died there before the end of the month, aged seventy-six. After his death, his style of painting quickly went out of fashion. His student John Collier and John William Godward carried it on for a while, but the time was over. It would be nearly sixty years before he was discovered again, and meanwhile his paintings sell for record prices. The image above is a detail, click on it for the full, rather oblong painting.